Hand Flesh Peel Off,Where did you think cannibals got their food? The meat market of course! 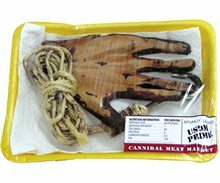 Fresh and bloody life-sized latex peeled hand is packaged in a uniquely disgusting Styrofoam meat container, and covered with plastic. 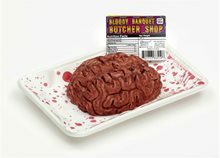 Be sure to look for more Cannibal Meat Market body parts, sold separately. 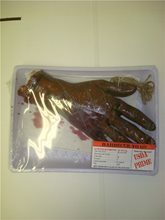 Bar-B-Q Hand Prop.Includes: One Bar-B-Q Hand Prop.The latest in sawed off extremities! 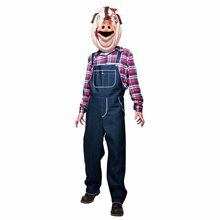 This bloody realistic Halloween decor item is sure to toe the line of good taste at any Halloween party. A great accent for any creepy corner of your dreadful home, freaky office or even the candy bowl, this dead mans hand will freak your guests! 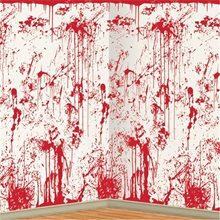 Bloody Wall Backdrp 4Fx30F,The Bloody Wall Backdrop is a gruesomely awesome backdrop for any haunted house or halloween party. This backdrop measures 4 feet tall by 30 feet wide. 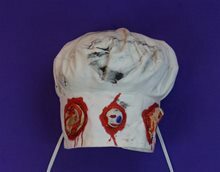 The background of the backdrop is white, with red bloody splatters all over. It is made of a thin plastic and it can be attached to your wall with thumb tacks, or double stick tape. Backdrop can be cut to fit any size. 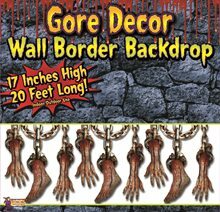 Blood Weapons Garland.Includes: One 7 1/2ft Bloody Weapons Garland.Dimensions: 7 1/2ft.As they say, the right tools for the right job! 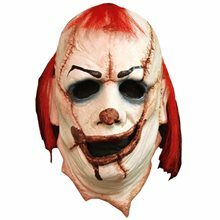 Perfect for decorating your haunted house or haunted party. 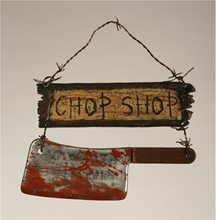 Decoration includes 7 1/2ft of slicing, dicing, slashing, chopping, stabbing and cutting fun. 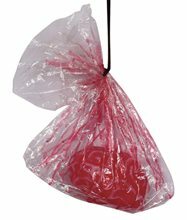 Tools are made of durable plastic and can be hung inside or outdoors. Yes, they look used but they will come nicely packaged and brand new, no additional charge for the blood!